This article studies the relationship between Alex Raymond’s Flash Gordon comic strip and its adaptation as a serial in 1936. It focuses on the second episode, “The Tunnel of Terror”, and on the three Sunday pages from February 1934 on which this episode was based, in order to examine the adaptation process from a technical and pragmatic point of view. Because the serial aims at being faithful to its source material, very similar scenes exist in both versions, which makes it possible to conduct a detailed comparison of narrative techniques. In addition to replicating certain panels from the comic strip, the serial contains examples of alternative narrative choices devised to replicate some of the effects of the source material, notably its temporality. This study suggests that the two versions differ mostly in the articulation between scenes and in the proximity established between the reader/viewer and the characters. 1Created by Alex Raymond in 1934 as an alternative to Buck Rogers, Flash Gordon’s success as a comic strip lead to an adaptation as a serial in 1936. Starring Buster Crabbe, and directed by Frederick Stephani, the Universal serial was in turn successful enough to be first reissued as a feature film that same year, followed by two sequels (Flash Gordon’s Trip to Mars, 1938 and Flash Gordon Conquers the Universe, 1940) and later syndicated for television. Its influence on science fiction has been felt ever since, and it is alternatively mentioned as a countermodel for serious efforts within the genre (writer Thomas Disch mentions the serial for its “immortal dopiness” (DISH, 1998, p. 5)), as a source of inspiration for later popular entertainment, notably for George Lucas’s Star Wars (ZITO, 1999, p. 47), or a handy reference to measure up other adventure films (Pauline Kael mentions it in reference to Dr No, the first James Bond movie (KAEL, 1963, p. 51-55)). Yet, in all these cases, the enthusiasm or disdain with which the serial is described strongly differs from the reverence devoted to Raymond’s work. While both cultural objects have survived to some extent, they now occupy very different places within popular culture. 2 The top of the page (roughly a third, plus additional white space) was devoted to Jungle Jim. 2Serials were a fitting medium to adapt comic strip and pulp series: both were cheap entertainment firmly located within the mass culture of the time, and more crucially, both thrived on long narratives broken down in shorter arcs separated by cliffhangers. Historically, the links between movie serials and popular fiction are numerous: Feuillade was adapting Fantomas for Pathé in 1913, barely a year after the appearance of the character in popular novels, and according to comics historian R.C. Harvey, the very notion of continuity within comic strips was inspired by the experience of the movie serial (HARVEY, 1998, p. 69-81). Before Flash Gordon, however, the only occurrence of a comic strip being adapted as a serial was Tailspin Tommy, a Lindbergh-inspired aviation strip - noted for its exoticism more than for its achievements within the form - which accompanied the vogue of aviation serials of the early thirties1. In spite of the concordance between the two forms, the rules to the adaptation of comics strips were therefore not established yet in 1936, and the adaptation of Alex Raymond’s Sunday pages2 in twenty-minute episodes can be considered as the prototype for the numerous adaptations that followed. 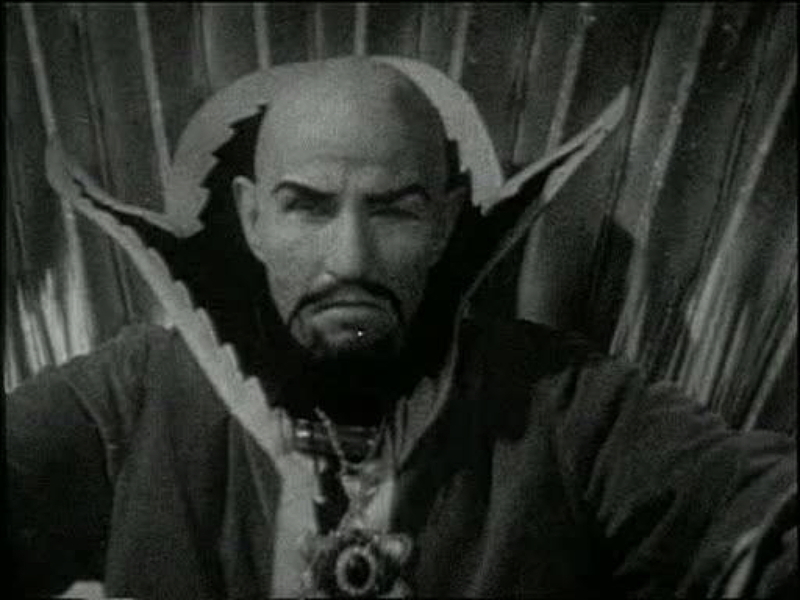 3While Flash Gordon offers specific difficulties because of its entirely fantastic setting, the comic strip’s grammar is, as we shall see, mostly unproblematic from a cinematic point of view. In other words, it constitutes a test case for adaptation, with a script that adheres to Raymond’s story and a mode of representation that is often deceptively close to cinematic technique. The comic strip and the serial, especially in its early episodes, thus offer a kind of minimal pairing whereby the distinction between the two forms can be examined. The technical and stylistic options available to filmmakers have evolved considerably since 1936, but the history of comics adaptations into films or TV shows offer few examples of such a pairing. Indeed, the respect paid to Raymond’s vision and style suggests that there is no hierarchy between the two forms, which is in itself a historical phenomenon. In 1936, the comics form had not yet been associated with comic books and juvenile reading, the legitimization of cinema was incomplete and the serial was still profitable enough to be treated seriously, from a financial and aesthetic standpoint. These trajectories were thus about to diverge, and this trend has only recently been reversed. In the last decade, the legitimization of comics creators, which had led to their being openly involved in the adaptation of their own works (Clowes on Ghost World, Gibbons on Watchmen, Miller on Sin City, etc.) has led to adaptations which one again seek to retain more than the story and characters of their source. However, even a short graphic novel such as Ghost World and its 80 pages, offers too much material for a 110 minute feature film. The long form of the serial thus allows us to question the need for condensation and rewriting, which has been described as integral to the adaptation of comics into films (LEFEVRE, 2007). 4This article will examine the way in which the serial strives to remain faithful to the images and rhythm of Raymond’s pages, while providing a spectacle suited to its medium. In order to move beyond the undeniable similitude in plot (“The cartoon version was followed as closely as any literary adaptation”, George Turner writes in his discussion of the serial (TURNER, 1983, p. 56)), markers of seriality, narrative rhythm, the relationship between comic layout and movie cutting as well as the status of images existing in both versions will be our main centers of interest. 5For clarity’s sake, this article will refer to the serial using the anachronistic name Space Soldiers, devised at the time of the TV syndication in 1951, rather than simply Flash Gordon, as it was known in 1936. 6It has often been noted that Space Soldiers seeks to recreate as much of Raymond’s vision as possible. According to actress Jean Rogers, who played Dale, the production even insisted on having the costume bright and colorful, even though the film was shot in black and white (KINNARD, 2008, p. 9). Universal bought the rights to Flash Gordon in 1935, while the strip was a year old, and the serial was shot in January and February 1936. At that point, the scriptwriters (Frederick Stephani himself, George Plympton, Basil Dickey and Ella O’Neill)3 had roughly two years of material to choose from. The serial focuses mostly on the first 14 months of the strip (up to the “Tournament of Death”), although it borrows elements from later episodes - including an invisibility subplot that appeared in print in late August 1935. In spite of many simplifications and reworkings, the serial sought to emulate the success of the strip by borrowing from it as much material as possible, within an unusually well budgeted production for this type of film.4 Thus, a variety of strategies were devised to transpose Gordon’s adventure from one medium to the other, implying careful considerations of rhythm, as well as extensive adjustments of the storyline. 7The comparison between the serial and Raymond’s strip also serves to point to the neglected popular underside of Raymond’s vision. Because the serial has not been turned into a museum piece to the same extent as the strip,5 it points to the origin and to the function of Flash Gordon, especially in its early years, when a balance exists between visual innovation and storytelling, a balance that disappeared later as Raymond’s accomplished art became the main attraction of the strip6. In particular, Space Soldiers restores the notion of a serial narrative: one of the effects of collected editions, be it a DVD set of the serial or an album-sized compilation of the strip, is the disappearance of the individual episode within a complete narrative7. At its simplest level, the fact that two episodes are presented at once to the reader on facing pages implies continuity between consecutive pages and discontinuity between those separated by a page-break. To quote from Thierry Groensteen, “les pages situées en vis-à-vis sont liées par une solidarité naturelle et prédisposées à dialoguer” even when they were not meant to (GROENSTEEN, 1999, p. 44)8. The break at the end of the collection and some easily skipped vestiges (the introductory caption and the “to be continued” mention) thus function as the sole traces of the page-to-page disconnection in the strip’s initial form. Furthermore, the notion of the Flash Gordon comic-strip as constituting one narrative is a very problematic one, if only because of the changes in authorship, prestige and context of publication. As early as 1940, for instance, the comic strip comprised daily strips by Larry Briggs in addition to Alex Raymond’s more famous Sunday pages, going in different directions. Even limiting ourselves to Raymond’s run, the abrupt changes in drawing style over the first few years (the shift from four to three tiers in July 1934, the brief full page tabloid-sized publication in April 1935, etc.) or Raymond’s gradual abandonment of the writing9 (not to mention the Return to Earth in 1941, during which the strip functions as a war story) all go against the notion of a unified work. 8The serial does tell a complete story, shot over a single six-week session, and entirely written before production began (KINNARD, 2008, p. 7). Seriality was nevertheless a defining feature of the project: the goal was not so much to produce a four-hour story as to produce 13 episodes that would bring young viewers back to the theaters for more Saturday matinees. Even in its modern collected form, Space Soldiers displays many ostensible markers of seriality, such as the recapitulative text or the opening replay of the last minute of the previous episodes. Stylistically speaking, the abundant use of repeated shots or the rhythmical structure of the episodes constantly reminds the viewer that the complete film was not conceived to be shown in one sitting. Moreover, the linearity of the movie makes it much more difficult for the viewer to ignore these elements than for the reader to skip their equivalents within the comic strip: the veneer of continuity that exists in modern presentations of the comic strip is absent even from collected editions of the serial. 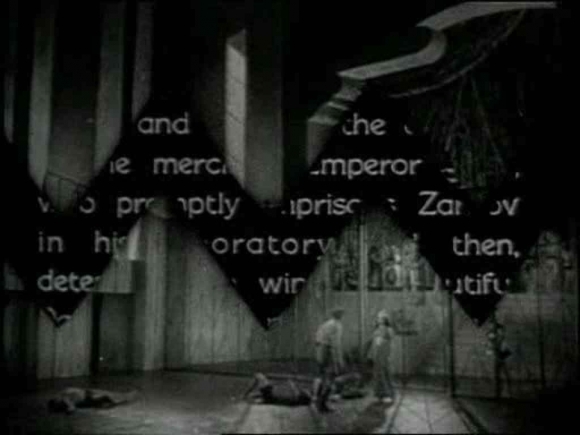 Symptomatically, when Space Soldiers was edited down to be shown as a feature film in late 1936, in an attempt to present a complete narrative, more than two thirds of the material was discarded. Both comic strips and serial now function as long narrative, but both existed first as a sequence of stand-alone episodes, which would not aggregate into a coherent narrative before months of viewing or reading. 9We will therefore not address here the process of adapting, Flash Gordon as a whole, from page to screen, but instead focus on a specific episode of the serial and its counterparts in the comic strip, in an attempt to understand them not as fragments but as constitutive elements, existing as discrete cultural objects rather than parts of a larger whole. After all, neither the serial nor the comic strip were seen for themselves, they were ancillaries to other, more respectable cultural objects (newspapers and feature films respectively), and while it is next to impossible to reconstitute the context in which they were apprehended at the time, observing individual episodes is a first step toward that reconstitution. In doing so we also hope to account for what Jan Baetens has recently called “le caractère inachevé, tronqué, imparfait, toujours déjà en cours et jamais fini, de la lecture d’un certain type de bande dessinée” (BAETENS, 2010).10 It also seems necessary to forego the idea that Flash Gordon, in any or both of its incarnation, is a “classic” from the “Golden Age” and to reframe it as popular entertainment,11 or in the words of a New York Times writer in 1936: “Art may come and go, but the serial is the stable fare of the screen”, (D.W.C., 1936) which could easily be transposed to the comic strip. 10The first episode of the serial and the first page of the comic strips are singular moments in these types of narrative, since it is only retrospectively, after the first “to be continued” has been read, that they come to be understood as part of a larger continuity. As early as the second episode, though, the serial structure is fully in place, displaying the tension between the need for the episode to function as an entry point and the aspiration of the regular spectator to see the story advance. 11“The Tunnel of Terror”, the second episode of Space Soldiers opens with Flash and Aura falling into a pit (cf. image 1), and ends with Flash desperately fighting a monster while he is trying to prevent Dale’s marriage to Ming the Merciless. This sequence corresponds closely to the fourth to sixth Sunday pages (February 4, 11 and 18 1934), which also start with Flash and Aura falling in a pit, and end with Flash facing a monster on his way to prevent Dale’s wedding, although the sequence of events in-between is not identical. Thus, after adapting the first four pages into a twenty minute episode (“The Planet of Peril”), the writers of the serial make use of a three-pages to an episode ratio, which is used again in episode three and four. This ratio does not turn into a general rule, though, as the divergence between the two stories progressively widens, making such a count increasingly unreliable. It is on the correspondence between “The Tunnel of Terror”(hereafter ToT) and the three Sunday pages that we will focus here. Alex Raymond, Flash Gordon. All rights reserved. 12Under the title, set in regular type on a blank space above the strip, the February 4 Sunday page is composed of twelve identical panels in four rows of three. Neatly inscribed in this grid, Raymond’s art sets perfectly drawn human figures, wearing carefully rendered clothes - mostly shown in full and never framed closer than from the waist up - against heavy black cast shadows and simplified backgrounds, shaped by thick brushwork. The solid colors used for the characters and their clothes, contained within thin and precise brush line, with minimal shadows, contrast strongly with the textured, mostly black and white background. Monsters, spaceships and the futuristic city in the eighth panel are also rendered in thin brush lines, but they don’t display the realistic perfection that they will attain in later episodes. “The tunnel of terror”, Flash Gordon, 1936. 13Apart from the title, the page contains little information connecting it to the three previous weekly episodes. The first caption, ambiguously placed at the bottom left of the first panel (it should be read after “A water pipe protrudes…”, but its position does not make it clear), mostly provides the name of the hero and the promise of pulpish horrors. Only in the second panel do we learn about the falling princess, unnamed at this point, and the third panel, while explaining what the “horrors” are, also introduces the name “Mongo”. Without an explicit summary, Raymond ensures that the reader knows who the characters are and where they stand, but not much more besides that: reconstructing the previous three episodes is impossible and implicitly useless. What is emphasized here is the micro-event, the fall towards the dragon, and the rest of the narrative is only accessible to readers with a good memory or those who kept clippings of the series. The first six panels of the page, half of the episode, represent a very short diegetic time - Flash and Aura in the pit - in a series of panels linked by moment-to-moment (panel 2 to 3, 5 to 6) and action-to-action (panel 1 to 2, 3 to 4, 4 to 5) transitions, in McCloud’s terminology (McCLOUD, 1993, p. 70). 14Throughout this sequence, introduced in medias res, Raymond achieves a forceful disconnection between reading time and diegetic time, through the use of text. Captions are located so as to be read before the event they describe and supplement: Flash is going to catch the pipe, he is going to save the princess, there are going to be dragons. Dashes even seek to inscribe the passing of time within these captions, inviting the reader to pause at suspenseful moments: “A water pipes protrudes from the wall - he grabs it - and hangs on!”. Events thus unfold twice, verbally then visually, until the sixth panel, where Aura utters the first word balloon on the page that spells the end of this sequence of closely connected panels. The next two rows of the page make use of scene-to-scene transitions, alternating between characters and sceneries, except for the last two panels, connected by a moment-to-moment transition, visually unified by the blue background sky. At that point, the narration slows down again into a moment made significant by the narrative device, before being confirmed as a cliffhanger by a “to be continued” on the bottom right of the last panel. 15It also bears mentioning that while the textual summary in the serial is on screen for 30 seconds in a 20 minute episode, a text of this length would occupy roughly the space of a panel in the twelve-panel Sunday page: it is thus imaginable that such a recapitulation could have been used, and significant that it was not. This opening sequence ends with a jaw-shaped wipe, before the action resumes (cf. image 2). This summary does not actually cover everything that happened so far, for in the previous episode, Flash already defeated the “ape-like man killers” and the cliffhanger left him falling in the pit, at the exact point where the Sunday page stopped. “The Tunnel of Terror”, Flash Gordon (dir. Frederick Stephani, sc. Frederick Stephani, George Plympton, Basil Dickey and Ella O’Neill ), Universal, 1936. All rights reserved. 16However, unlike readers, viewers could not pause and remember what happened the week before, get back to the previous week’s comic page or simply explore the opening situation until it is fully understood. A conventional strategy was therefore to reuse some of the footage of the previous episode, editing it slightly, so as to create an overlap between the two episodes, which provides some necessary context for the resolution of the cliffhanger. Accordingly, the first sequence of ToT begins after the fight in the arena, but before the fall, with an establishing shot showing the whole of the spectacular throne room set. 17The serial thus use a variety of devices to ensure the spectator knows what he is watching, from the introduction of the characters in the credits, to the multiple recapitulating strategies. This points again to the fact that unlike the comic strip, the serial has a complete story to tell, written and shot entirely before being shown: the existence of a narrative arc over the 13 episodes justifies the presence of the summaries and enables a pertinent selection of information relevant to the whole narrative.13 While princess Aura goes unnamed when she first appears in the comic strip, she is present in the credits of the first episode of Space Soldiers, even before Flash lands on Mongo. While the serial is not meant to function as a complete, fluid narrative, the promise of continuity inherent in this title sequence and mirrored by the cliffhanger at the end of the episode, were key ingredients to secure the loyalty of the audience over the three months during which the serial would play. 18Notwithstanding these differences in the way both cultural objects display their serial nature, the opening sequence of ToT and the first six panels of the February 4 Sunday page have a lot in common when it comes to rhythm. Both strive to depict a short and intense span of time, while dilating it to allow the reader/spectator to enjoy it fully. In the serial, editing tactics replace the captions in Raymond’s strip, to achieve this dilation. 19On its face, this is a very fast-cut sequence, with an average shot length (ASL) of two seconds, roughly comparable to modern action movies and much faster than the Hollywood norm of roughly 10 seconds at the time14. This fast-pace, which enlivens the brawl between Flash, Aura and Ming’s soldier, then their fall, is achieved, however, through the abundant use of reaction shots. Their presence is justified by the setting of the scene, with Ming and Dale watching the fight from the top of the monumental staircase, but their recurrence – there are 8 such shots in a minute and a half – reveals their function as rhythmical devices. Though there are slight variations between them, and though they typically last less than a second, their purpose is essentially to stop the action in order to provide and reinforce an appropriate “reading” of the scene for the viewer, which is not be readily derived from the action itself: Flash knocks down a soldier and Ming’s frown indicates that the entire fight is going the hero’s way (cf. images 3 and 4), Flash wrestles a raygun from a soldier and Dale’s tensed gaze emphasize the danger, etc. 20However, these reaction shots are not simultaneous with the action, they interrupt it and allow it to resume at the exact frame where it had stopped. The master shot of the action is thus cut, but the reaction shots are inserted between frames, their length is not compensated by any deletion in the master shot. In the example below, Aura picks up a raygun on the floor and starts getting up. 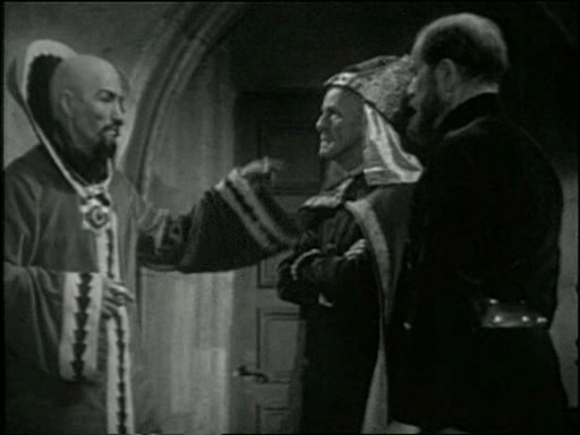 The scene cuts to long shot including Dale and Ming, with Ming rising up from his throne, lasting slightly more than a second. Then the scene cuts back to Aura, in the same position as she was, who gets up briskly and starts running toward the lower right corner of the screen. Here and in many other occurrences in the same scene, cuts to the spectators or even to different aspects of the action (when Flash and Aura are not in the frame at the same time) imply simultaneity rather than chronology. 21Towards the end of the scene, Flash and Aura fall into the pit (in a high angle shot that mimics the last panel on the January 28, 1934 Sunday page) and a special effect shot reveals that giant lizards lurk at the bottom. Ming reacts and orders one of his soldiers to “save [his] daughter” by deploying a net in the pit. After another special effect shot, Flash and Dale are shown from above as they hit the net, then they are shown hitting the net again, but this time from the side of the pit, in a shot framed similarly to the first two panels of the episode in the comic strip (cf. image 6). In the climax of the opening sequence, the action is expanded twice: not only by crosscutting (seven seconds elapse between the shot showing the beginning of the fall and their hitting the net, implying a 240 meters fall, unless Ming’s reaction is assumed to be simultaneous) but also by a deliberate and very visible repetition of the moment of resolution in a striking violation of continuity editing. Though the editing of serials is not always faultless, because of the constraints of matching stock-shots with original footage, in this case, there is no doubt that this was deliberately done to emphasize this moment when the cliffhanger set up in the previous episode and reiterated in the first minute and a half of ToT is resolved at last. Aura and Flash fall on the net twice, in these two consecutive shots. 22After this point, the end of the scene is considerably slower, with an ASL of 4 seconds (as opposed to 1.4 second up to that point), and a much simpler editing pattern. Flash does not leap above the dragons but he still gets to hold Aura in his arms before she opens a passage to a secret staircase. 23While the chronology of the event and the points of tension are rearranged, the convergence between the comic strip and the serial up to this point is remarkable. From a narrative point of view, the fall, the sexual tension, the dragons, Aura’s role in finding an exit are all on display here, and more strikingly, stylistic elements are recreated in the adaptation with editing as a substitute for the text-picture interaction in the comic strip. The contrast between attractive human figures and more abstract background, for example, is as striking in the serial as it was in Raymond’s page (see images 3 and 5 for instance). The serial sacrifices some narrative consistency in order to reconstitute one of the seven panels on which the opening sequence of ToT is based: while she is in no danger of being eaten by the dragons, Aura rushes into Flash’s arms for comfort. In doing so, she makes it possible to reenact the third panel of the Sunday page, the actors’ line of sight directing our attention to an off-screen menace located precisely where the dragons are in Raymond’s panel. The ostensible presence of the wall and the high-angle framing are also borrowed from Raymond’s illustration.15 The shot is also notable in that is the longest of the entire scene, with a full 8 second, allowing potential early Raymond experts to spot the similarities. 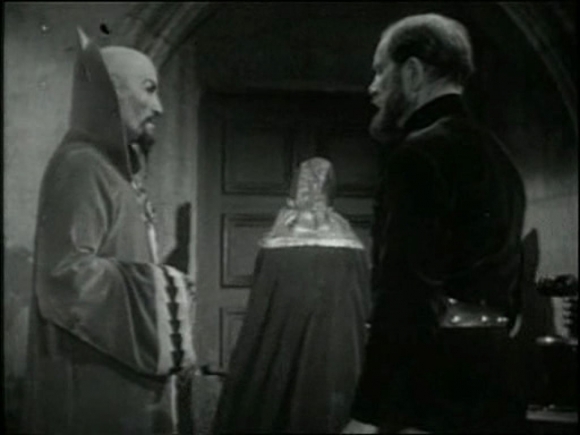 Left: “The Tunnel of Terror”, Flash Gordon, Universal, 1936. Right: Alex Raymond, Flash Gordon. All rights reserved. 24This opening sequence demonstrates that far from relying on the comic strip as a storyboard as sometimes asserted (HARMON, 1973, p. 31), Space Soldiers is firmly inscribed within its own form, and makes use of the possibilities of this form to replicate some of the effect of Raymond’s strip rather than its appearance. 25Considering ToT as a whole reveals the existence of two other focal points, during which the editing is brisk and the action spectacular. The first in a spaceship battle between Flash, piloting one of Ming’s rockets, and a fleet of lion men’s “gyro-spins”. Laden with special effect shots, the battle lasts a little more than four minutes, at the exact center of the episode. Although this is the longest scene in the episode, it is also the fastest, with an ASL of 2.5 second. The pace then slows down radically, to pick up only in the last three minutes of the episode, as the cliffhanger is set up, and Stephani uses a fast crosscutting between the ceremony about to conclude Dale’s forced marriage to Ming and Flash’s attempt to rescue her. There again, events shown in successive shots but in different locations are treated as simultaneous rather than consecutive, and the cliffhanger shows Flash fainting in the claw of the monster which guards the room where the ceremony is about to end. 26Thus, the episode is structured around three symmetrically arranged scenes of action, that take up roughly half of its running time, with the rest taken up by slower scenes, alternating between numerous sets, with little meaningful interactions between the main characters. A variety of spectacular swipe transitions, even between short scenes, emphasizes the disconnection between these various moments and places, and reveals by contrast the unity of the long action sequences. Conversely, the slower cutting pace in these scenes also makes it possible to stage some elaborately composed shots, through sophisticated camera movements (when Ming enters Zarkov’s lab at 4’40’’, after a cut to Dale in Ming’s harem, at 12’50’’), canted shots and deep space mise en scène in Zarkov’s lab (cf. image 4, 4’30’’ to 5’30’’), or a symmetrical composition to ornate a long dialogue (image 9, at 8’02”). Deep space mise en scène, a rare device in a Hollywood film in 1936. “The Tunnel of Terror”, Flash Gordon, Universal, 1936. All rights reserved. A sophisticated composition. 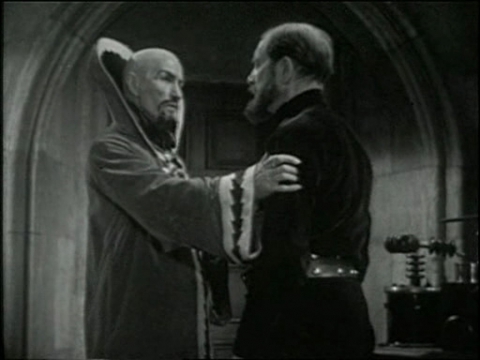 As the priest leaves by the back door, the camera pans to the right to frame Ming and Zarkov as equals, at a time when the scientist's role is still ambiguous for the viewer. 27This aestheticization, infrequent in serials of the same period, recalls Raymond’s own infusion of pulp material with artistic excellence. In spite of a limited budget when compared to a feature film,16 in spite of its recycled props and sets, Space Soldiers therefore manages to briefly capture one of the essential features of the strip, through demanding but fairly inexpensive cinematographic choices. 28In addition to this focus on visual and rhythmical correspondence between film and strip, including as we have seen the invention of parallel narrative strategies to account for the differences between the two media, the serial also aims at replicating the idealized human figures so characteristic of Raymond's art. Buster Crabbe, who dyed his hair blond for the film, looks strikingly like Raymond's portrayal, and even though Jean Rogers is blonde, she is suitably sensuous and beautiful in her impersonation of Dale Arden. With the notable exception of Prince Barin in later episodes, the rest of the cast is aptly chosen and convincing make-up and props are used for fantastic characters, notably for Ming, as well as for Vultan of the hawkmen17. Nevertheless, for all the care and craft devoted to the adaptation, reading Flash Gordon and watching Space Soldiers are very different experiences. In part, this can be explained by the oft-noted fact that the comics page can contain scenes that would be difficult or – in the digital age – expensive to replicate on the movie screen (LEFEVRE, 2007). It is a moot question whether what now appears as flaws, or imperfect craft, was perceived as such by Space Soldiers’ original audience, for what the retrospective glance reveals is the conventional nature of representation in the serial, which despite being shot in live-action relied as much as the comic strip on a willing suspension of disbelief in order to be accepted as taking place in a coherent diegetic world. Even though it is shot in classic Hollywood style, sometimes described as “transparent” storytelling (MALTBY, 2003, p. 465), Space Soldiers never tries to pass itself off as anything but a carefully constructed and orchestrated spectacle, with no aspirations to realism, in line with the dominant aesthetics in fantastic films of the time.18 The comic strip’s aesthetics, largely similar in early 1934 to Hal Foster’s work on Tarzan (from the precise brushwork, to the framing privileging the full human figure to the reliance on captions instead of speech balloons), is no less stylized, yet it is only marginally constrained by technical necessities, limited mostly to the coloring and the reproduction process. Some of the differences between the strip and the serial thus derive from the specific role played by technology, and Space Soldiers is obsolete in the sense that, stylistic considerations aside, a modern professional production would easily improve on most of its selling points, which does not hold true in the case of the comic strip. However, the various technological updates (in 1980 but also in the 2007 TV series) suggest that Raymond’s art is evocative precisely because it falls short of realism. The role of technical limitations should therefore not be overstated, and recent digital blockbusters have demonstrated the difficulty of capturing comic book imagery, even when this imagery is not tied to an idiosyncratic style (Sin City in which Frank Miller was heavily involved, is arguably a counterexample (MILLER, 2005)). If we are to follow Ernst Gombrich in describing style in the visual art as the intersection of will and skill, these limitations should even be seen as one of the sources of Space Soldiers’ singular form rather as a limitation (GOMBRICH, 1996, p. 89-112). 30Similarly, the aesthetics of recycling that pervades serials and B-movies does relatively little to explain the differences between the two incarnations of Flash Gordon, when both are considered as serialized entertainment. Its main effect is the constant re-use of sets, shots and even short sequences from episode to episode. However, in ToT, only one shot seem to be used more than once: a special effect shot of Flash's rocket over a scrolling background simulating a rightward movement (at 9'). This obvious constraint in the design of the serial as a whole is thus all but absent from the individual episode seen as a narrative unit. Similarly, the reuse of sets, music and costumes (Ming's regular soldiers wear Roman uniforms) is at times conspicuous, but not much more so than Raymond's own borrowing of preexisting elements from other popular sources, from the evil Asian mastermind to the pagan god (KINNARD, 2008, p. 6-8). The serial makes this process of borrowing and recomposition of a fictional world more open and blunter, but the process is remarkably similar. While the relatively sparse use of stock shots creates some visual discontinuity, notably when an impressive number of dancers undulate around a massive statue (at 16', the extract taken from The Midnight Sun, 1927 (HARMON, 1973, p. 31)), the problem is once more merely technical. It is also not specific to the serial, even though the discontinuities caused by stock shots and moving models tend to be less conspicuous in contemporary feature films. It is therefore not only technique which distinguishes the serial from the comic strip, but diverging narrative strategies. The difference seems to lie in their respective treatment of scene to scene continuity, which ultimately reflects on the scale of the events being depicted. 31In the tenth panel of the February 4 page, after Flash has been locked in a rocket by Aura, a caption reads: “While planning a possible escape from the ship, Flash dons some clothes he finds on the ship -- suddenly, he hears an ear-splitting crash -- he rushes to the window”. Flash is then shown looking to the right towards the next panel, where “A deadly squadron of space-gyros spins over the city, destroying it. “ Then the last panel shows Flash's rockets arriving on the scene to engage the gyros. The reader follows Flash's progress closely over the page: he is directly visible in eight of the twelve panels, shown in a vehicle in three and the source of the reader’s point of view in the last. However, within this sequence, at least two ellipses take place, between panel 9 and 10, then between panel 11 and 12, made explicit by the captions. Moreover, the amount of diegetic time elapsing within a single panel appears to vary considerably. 32In the February 11 page, the first two rows focus on Ming, with a notable ellipsis between panel 3 and 4. In panel 6, Ming starts watching an aerial battle on a television screen (“a spaceograph”), which unfolds the third row, while the fourth depicts Flash inside his rocket, then crashed on the ground. Again, through the device of the television screen, the page unfolds without a narrative break, but with several ellipses and changes of rhythm, explicated by the captions (cf. image 10). 33A similar pattern is at work again in the February 18 page, with the only apparent discontinuity occurring when Flash telepathically addresses Dale, still held prisoner by Ming, but with considerable variations in the diegetic time represented by each panel or each panel-to-panel transition. 34In all three pages, Raymond follows a single narrative thread, with only three shifts of the narrative instance from one place to another (as opposed to following a character's movements), all motivated within the narrative by a character’s direct observation or by a mean of communication allowing the distant transmissions of sight or sound. If we consider the three page sequence as a whole for comparison's sake, a further discontinuity appears between the first two pages, with the action shifting from Flash to Aura and Ming and apparently moving backward chronologically. 35In ToT, the narration is much more fragmented: in addition to Flash, the serial follows Dale and Zarkov even at times when nothing crucial to the progression of the storyline happens to them. Discontinuities are underlined, as scene-to-scene transitions are accompanied by varied graphical swipes, and there are eight such transitions in the course of the twenty-minute episode. A different balance is struck, whereby all three major characters are presented as important to the story, while the comic strip at that time all but excludes Zarkov, and to a lesser extent Dale, from the story.19 ToT makes use of some of the transitions imagined by Raymond to mirror the narrative articulations found in the comic strip: Flash and Aura escape to the rocket without a demarcating swipe, changing the location without a notable scene break. Ming still watches the battle on a television screen, again changing the location of the action without an explicit scene break and Flash still initiates the aerial battle after having discovered the gyros from the rocket, as shown through a point of view shot. In the final scene of the episode, cross-cutting between Flash's rescue attempt and the wedding ceremony between Aura and Ming, the underlined transitions are also notably absent. In effect, every occurrence of the swipe denotes a transition that is not directly motivated by the previous scene or by the character's action. Paradoxically, this fragmentation of the narrative in almost disjointed fragments, limited to the lulls between the three main events of the episode (the opening, the aerial battle, the rescue attempt), aims at filling-in the blanks in the original story. The disjunctions in the narrative are used to depict peripheral events, to complete the trajectories of the main characters to the detriment of the main storyline. The lacunary but roughly linear structure of the comic page is replaced by a sprawling narration, jumping from place to place for the sake of completeness. 36The same process occurs within given scenes, removing many ellipses in favor of a more detailed depiction: Flash is shown finding some new clothes, starting to undress (around 7'), then finishing to put on his clothes (around 8'), learning to pilot the rocket, flying to engage the gyros, etc. To the variation in rhythm of the comic strip, the serial substitutes a refusal of ellipsis, which culminates in these moments when simultaneous events are depicted sequentially. The serial therefore appears to move at a steady rhythm, roughly coinciding with real time. The five repetitions of the special effect shot displaying the travelling rocket not only serve to pad out the episode, but also suggest that the entirety of the flight is shown. While the rocket was shown only in flight in the February 4 and February 11 Sunday pages, the serial adds the take-off and the crash, in addition to the flight itself. Similarly, characters are shown entering and exiting rooms, transitory moments that do not serve any purpose except conveying the notion that the entire duration of their presence has been narrated. The rhythm is that of individual action, with no shift to a different scale. Whenever Flash's rocket maneuvers, he is shown piloting, inside of the ship. By contrast, Raymond only shows him in the rocket before take-off and as he is about to crash. While the comic strip takes some distance, narration in the serial is firmly anchored to individual time and individual actions. The numerous reaction shots serve the same purpose: they ensure that no character is left out, even at times when they do not directly participate. 37The result is a shift of emphasis in the adaptation, as the focus moves from the story to the characters. In Raymond's strip, an explicit narrator is present in addition to the implicit narrative instance implied by the layout and framing. Even dialogues are frequently conveyed as indirect speech in the captions: “Telling Flash he will be secure against the wrath of her father, she bids him enter the ship” (February 4, panel 9). The reader cannot ignore that he is told a story, and while this narrative voice uses a narrative present, the presence of the narrator and the ad hoc variations in rhythm all point to an overarching order. Flash is not an active character, he is led first by Aura, then by Thun the lion-man and Dale to accomplish his feats, and his ignorance contrasts with the narrator's omniscience, which not only provides insights in the characters' psyche (“They resolutely press onward”, February 18, panel 10) but also scientific and zoological information about Mongo, such as the name of the two-headed beast encountered by Flash and Thun (“Tsak, the two-headed guardian of the Tunnel of Terror”). This omniscient narrator points to the fact that there are many things in the diegetic universe outside the grasp of the main characters and also provides a sense of a scale greater than the individual. The comic strip ignores characters for a while, does not follow-up on some of its plot points (Dale is “dehumanized” by a “dehumanizer” to no visible effect) and alludes to knowledge which none of the characters could have: it constantly points to its omissions and to the existence of Mongo beyond what is explicitly shown. This is not an exercise in world-building as used in modern franchises, in that Mongo is never more important than Flash’s adventures,20 but these devices nevertheless hint at possible extensions of the diegetic universe. They also enlarge the scale to the point where the heroic deeds of its stoical main character, such as saving a princess from dragons or rescuing a city, take a mythical resonance.21 In Raymond’s strip, what is off-panel is a blank slate, a potential for new stories (Flash’s return to Ming’s capital in 1941 shows the extent of what can be fitted in that blank slate) while Space Soldiers never suggests that there is anything off-screen but an empty set and more recycled props. 38Flash's actions in ToT are similar to those of his comic strip counterpart, and are frequently as impressive, but they never achieve the same heroic undertones. Nothing in ToT suggests the existence of an off-screen diegetic universe, since the script and the editing purport to play out every action in its entirety. Realism is not the object, but Flash has to be shown trying out the controls for a few seconds before he can master the controls of the rocket, for instance. Conversely, the constant reduction of the grandiose (the aerial battle) to the individual scale (Flash and Thun in their respective ships) negates the dissociation between the story and the characters at work in the comic strip. This results in a much more humane but also more trivial story. Buster Crabbe's Flash is a more sympathetic and charismatic character than Raymond's stoic statue. With no ostensible narrator in the serial, outside of the opening expository title,22 Crabbe’s Flash gets to speak all his lines, to face the camera (there is no panel equivalent to a close-up in the February pages of the strip), and his actions dictate the pace and direction of the narrative. The same remarks apply to Dale and Zakov, who are promoted from props to characters, and whose importance is much accrued in the translation. In the three pages corresponding to ToT, Zarkov does not appear and Dale is present in only three panels; in two of those, she is bound and silent. It is most of all through a choice in editing and in scene-to-scene transitions, supplemented by the disappearance of the omniscient narrator that this shift from the grandiose to the personal is accomplished. 39The treatment of cliffhangers, while necessarily inconclusive owing to the small sample studied here, seems to support this notion of a different ambition in each medium. There are two types of cliffhangers in three Sunday pages considered so far. One could be called a cliffhanger of anticipation: Flash’s rocket is about the engage the gyros, or Flash himself faces the monster. The other would be a cliffhanger of present danger: the hero faces imminent peril, so dire as to appear unavoidable. The February 11 page presents such a case, with Flash lying unconscious as Thun is about to hit him with his saber (cf. image 9). Symptomatically, ToT reframes the cliffhanger of anticipation (Flash in front of the monster) as a cliffhanger of present danger, by allowing the beginning of the fight itself to take place within the episode. While this distinction is apt to become blurry in many cases, it underlines the notion that Raymond’s goal in the comic strip is not to maximize the thrills to be had. Both types of cliffhanger have the same function, inducing the reader or viewer to invest him or herself in the following episode, so as to develop his or her fidelity to the serialized narrative. However, cliffhangers of anticipation rely on the reader’s curiosity for the story (what happens next?) and for the craft (what will it look like? ), while the cliffhanger of present danger shifts the attention exclusively to the fate of the hero, making it the only point of interest from one week to the next. It also ensures that a given episode ends on its most thrilling moment, if only because it remains unfinished. ToT emphasizes its characters, short-term effects and constant thrills. Even the film format, the almost square “academy” format, perfectly suited to close-ups, contrasts in that regard with Raymond’s wide panels. This, in essence, is the difference between these two narratives, which share so much content and even stylistic options in other respects. 40The Flash Gordon comic strip and Space Soldiers illustrate the complexity of any translation from one medium to another. Space Soldiers, and especially ToT is faithful to some of the most salient features of Raymond’s strip, from its story to its willingness to create enduring images to its sensuality to narrative tactics in key moments, yet, the experience of watching the serial differs greatly from that of reading the original strip. The differences in modes of consumption are not negligible, but it is mostly in scene-to-scene continuity and in the distance from the characters that the two versions diverge. This proximity with the character might be inherent to the transition from the drawn page to the film. The audience frequently has an intertextual relationship with most actors, creating bonds, adhesion or rejection that may not inhere in the narrative itself (Thora Birch’s character in Ghost World is enriched by her having been a star of American Beauty). Furthermore, in film, body language and facial expressions are continuous. They do not adhere to the tempo of the action and the dialogues as they do in comics and resist stylization. 23 Cf. TIME, 1938 and LABARRE, 2007, p. 250-2. 41With its emphasis on close-ups, reaction shots, summaries, repetitions and completeness, Space Soldiers alters the scale of the narrative, narrows it down to a character-driven plot, in which the viewer has no choice but to follow Flash, Dale and Zarkov even in their most irrelevant moments. Space Soldiers seeks to create proximity with these characters, while Raymond’s strip deliberately keeps them at a certain distance. While Raymond’s vision came to define the streamlined vision of the late thirties23 and has survived as a work of graphic art, almost detached from the story it purported to tell (“tired clichés from the pulp-fiction genres”, in the words of historian Brian Walker (WALKER, 2004, p. 200)), Space Soldiers has survived as entertainment, mostly presented in cheap DVD packages and discussed with enthusiasm in journalistic and fan books. Many factors include these diverging trajectories but as the present study has sought to show, they were partly inscribed in the cultural objects themselves and in their respective narrative strategies. BORDWELL, David. STAIGER, Janet. THOMPSON, Kristin. Classical Hollywood Cinema, Film Style & Mode of Production to 1960. New York City : Routledge, 1988. BORDWELL, David. STAIGER, Janet. THOMPSON, Kristin. Film Art, an Introduction. 5th ed. New York City : McGraw-Hill, 1997. BOULD, Mark. “Adapting Flash Gordon”. In Film International, 2007, vol. 5, No.2, p. 18-26. CURTIS, James. James Whale : A New World of Gods and Monsters. Boston : Faber and Faber, 1998. DISCH, Thomas M. The Dreams Our Stuff Is Made Of : How Science Fiction Conquered The World. New York : Simon and Shuster, 1998. D.W.C. “That Hardy Perennial, the Serial”. The New York Times. NYC : January 26, 1936. GOMBRICH, Ernst H. “Truth and the Stereotype”. In The Essential Gombrich. London : Phaidon Press, 1996. GROENSTEEN, Thierry. Système de la bande dessinée. Paris : PUF, 1999. 224 p. ISBN 9782130501831. GROENSTEEN, Thierry. The System of Comics. Translated by Bart Beaty et Nick Nguyen Oxford. (USA) : University of Mississippi Press, 2007. HARVEY, R.C. The art of the funnies : an aesthetic history. Oxford (USA) : University Press of Mississippi, 1994. HARVEY, R.C. Children of the Yellow Kid. Seattle : University of Washington Press, 1998. HARMON, Jim. GLUT, Donald F. Great Movie Serials.London : Woburn Books, 1973. KAEL, Pauline. “Films of the Quarter”. In Film Quarterly. Autumn 1963, vol. 17, No. 1, p. 51-55. KINNARD, Roy. CRNKOVICH, Tony. VITONE, R.J.The Flash Gordon Serials, 1936-1940 : A Heavily Illustrated Guide. Jefferson : McFarland & Company, 2008. JENKINS, Henry. Convergence Culture. New York City : New York University Press, 2006, p. 114. LEFEVRE, Pascal. “Incompatible Visual Ontologies”. In GORDON, JANCOVICH and MacALLISTER (eds.). Film and Comic Books. Oxford (USA) : University Press of Mississipi, 2007, p. 3-5. MALTBY, Richard. Hollywood Cinema. 2nd ed. Oxford (UK) : Wiley-Blackwell, 2003. McCLOUD, Scott. Understanding Comics, the Invisible Art. New York : Kitchen Sink Press, 1993. McDONALD, Dwight. “A Theory of Mass Culture”. Diogenes. September 1953, n° 3, p. 1-17. MILLER Frank. RODRIGUEZ, Robert. TARANTINO, Quentin (dir.). Sin city, Miramax, 2005. RAYMOND, Alex. Flash Gordon (volume 3, époque 01/1934-10/1936). Paris : Serg, 1973. STEPHANI, Frederik (dir.) “The Tunnel of Terror” (Flash Gordon). STEPHANI, Frederick. PLYMPTON, George. O’NEILL, Ella. Universal, 1936. ROBERTS, Tom. Alex Raymond : His Life and Art. Silver Spring : Adventure House, 2007. TURNER, George. “Making the Flash Gordon Serials”. American Cinematographer. June 1983, vol. 64, n° 6. VARIETY, “Flash Gordon” [review]. Variety. March 11, 1936, p. 27. WALKER, Brian. The Comics Before 1945. New York City : Harry Abrams Publishers, 2004. ZITO, Stephen. “George Lucas Goes Far Out” . In Sally Kline [ed. ], Interviews with George Lucas. Jackson : University of Mississippi Press, 1999. 1 In spite of this, the serial puts great emphasis on the fact that Tailspin Tommy is an adaptation, from the trailers, showing clipped up daily and Sunday strips, to the credits, where Hal Forrest’s name features prominently. It is hardly a coincidence that Tailspin Tommy, “one of the earliest attempt at realistic rendering” in comic strip (cf. HARVEY, 1998, p. 85), even before Foster’s Tarzan, was also the first comic strip to be adapted as a serial. Note however that other strips (notably Bringing up Father, Joe Palooka, Little Annie Rooney, Little Orphan Annie) had already been adapted as feature films, while Ally Sloper and The Katzenjammer Kids had been made into one-reelers as early as 1898 (source : The Internet Movie Database. URL <http://www.imdb.com/>). 3 Though Stephani was a relative newcomer, and was directing for the first time, the other three screenwriters were veterans of the B-movie and serial script. 4 The authors of The Flash Gordon Serials estimate that Flash Gordon had a budget of 350,000$, compared to an average budget of 200,00$ for other Universal serials. The rights to the comic strip amounted to 10,000$, an average figure according to the New York Times at the time (cf. KINNARD,2008, p. 6 and D.W.C., 1936). 5 A French reprint, by Serg editions, calls it a “classic from the golden age of comics”, as early as 1973. More recently, Jim Keefe, who wrote the strip from 1996 to 2003, included short pieces about the strip’s history even as it continued its development (cf. RAYMOND, 1973). 6 While R.C. Harvey describes the later period of the strip as an “illustrated novel” (HARVEY, 1994, p. 135), artist Al Williamson notes that in the early strip, “[Raymond] is not yet so awe-inspiringly great that one ignores the story” (ROBERTS, 2007, p. 30). 7 Some collected French editions (Serg, Dargaud) even took pain to remove the “To Be Continued” mention at the bottom of each page from the early episodes, and the recapitulative texts in the first panel were at times rewritten to avoid unnecessary repetitions. 8 “pages situated opposite each other are dependent on a natural solidarity, and predisposed to speak to each other” (GROENSTEEN, 2007, p. 35). 9 Though there is disagreement at to whether Larry Moore, who co-wrote the strip, was present from the beginning of Flash Gordon, Raymond’s biographer suggests that Moore may have started working on the strip only in August or September 1935, thus contributing very little or nothing to the material used for Space Soldiers (cf. ROBERTS, 2007, p. 33-34). 11 Of course, this study is not devoid of essentialization of its object, since the context of consumption (be it the Jungle Jim strip or the other films shown at the matinee), which informed the way the individual episode was read, will not be addressed here. 12 This credit sequence differs in the TV version, notably because Raymond’s name is omitted from the title screen. While the author was famous in 1936 (cf. ROBERTS, 2007, p. 36), he had ceased being associated with the character for eight years when the serial was broadcast on television, in 1951. However, the name of the King Feature Syndicate is still clearly visible. 13 It is worth noting that while Saturday serials targeted children, this summary is only accessible to literate viewers. The use of narrative would allow younger children to appreciate the action even without this text. Some later comics adaptations would use specially made comic strip panels to recapitulate the story, starting with Ace Drummond, another Universal serial from 1936, which also starred Jean Rogers. The comic strip based summary in the second episode of Ace Drummond “The Invisible Enemy”, does not contain any word balloons and is on screen for 24 seconds. The episode also uses some overlapping footage from the first serial. 14 In the article “B’s in their bonnets”, David Bordwell suggests in that B movies of the period tended to be cut faster than prestigious features. ToT is still on the upper end of the spectrum, with an ASL of 3,9 seconds over the complete twenty minutes. Of the various examples given by Bordwell, only Tarzan Finds a Son (Thorpe, MGM, 1939), which has much in common with a serial thanks to its source material and abundant use of stock shots, is cut faster. Cf. BORDWELL, 1988, p. 61 and BORDWELL, 2007. 15 Note that while “Space Soldiers” used the 1.33 : 1 width to height ratio, Raymond’s panel uses a roughly 2 :1 ratio, closer to the widescreen presentations which Hollywood adopted in the fifties. Cf. BORDWELL, 1997, p. 228. 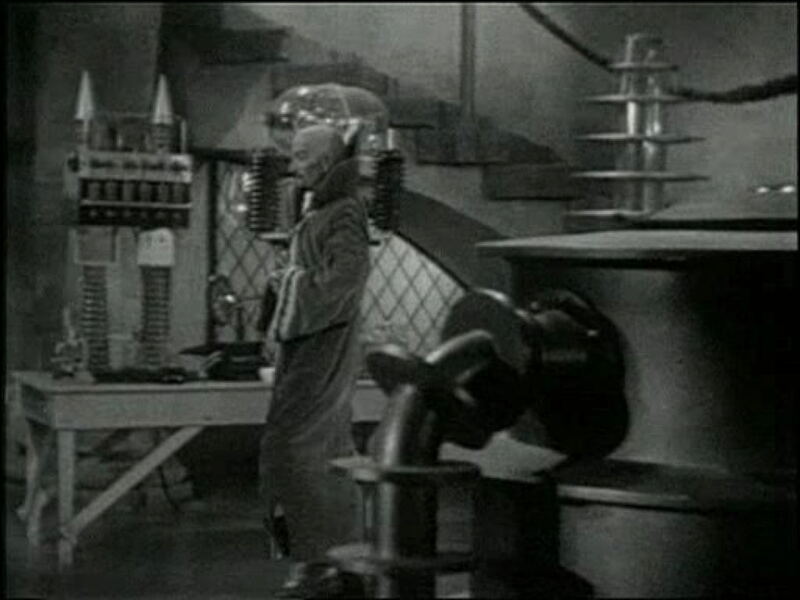 16 While lavish, relative to other serials, Space Soldiers’ budget for thirteen twenty-minute episodes was inferior to that of The Bride of Frankenstein, from which it borrowed some sets and props, which has a running time of only 75 minutes. This belies a Variety review from 1936 suggesting that “feature production standards have been maintained”. Cf. CURTIS, 1998, p. 241 and VARIETY, 1936, p. 27. 17 The 1980 version, by Mike Hodges. also emphasized Flash dazzling blondness, but associated it with sexual ambivalence rather than manichean heroism. Cf. BOULD, 2007. 18 This aesthetics is famously on display in Universal monster movies from the thirties, with shallow and symbolic background; a good example would be Frankenstein’s monster wandering in a graveyard under a blind angel statue in James Whales’s Bride of Frankenstein, with cinematographer John Mescall. Though there is a distinction between science-fiction and fantastic, the two genres were very close in their cinematographic incarnations at the time, being notably united by the common archetype of the mad scientist/faustian experimenter (cf. MacDONALD, 1953, p. 12-13). Space Soldiers reused several sets and props first seen in fantastic films. Later fantastic movies, from the Hammer films to Night of the Living Dead (1968) to Paranormal Activity (2007) have integrated realistic treatments of several or all elements of the genre. 19 Of course, there is also the benefit of hindsight, since the serial was fully written before being shot. Since the authors knew where the characters would end up, it was possible to accompany this progress. On the contrary, it is likely that Raymond did not know exactly what would become of Zarkov after the first episodes of the strips. 20 Henry Jenkins suggests that in modern franchises such as The Matrix : “Artists create compelling environment that cannot be fully explored or exhausted within a single work or a single medium. The world is bigger than the film, bigger even than the franchise.” (cf. JENKINS, 2006, p. 114). 21 This move toward a grand scale and mythical deeds, supported by the physical perception of the main protagonists, becomes even more pronounced in the later years of Raymond's work on the strip, especially as the shift from four to three then two rows offered him more room within the frame to develop this portrayal. Nicolas Labarre est maître de conférences à l’université Bordeaux 3 Michel de Montaigne et est membre du laboratoire « Culture et littérature des mondes anglophones ». Après une thèse consacrée aux théories de la culture de masse, ses recherches portent essentiellement sur la bande dessinée, autour des thématiques du genre, de l’adaptation et des questions de légitimité culturelle. Nicolas Labarre is an assistant professor at University Bordeaux 3 (France) and belongs to the “Culture et littérature des mondes anglophones” research unit. He has worked on mass culture theories, and his current research focuses on issues of genre, narrative constraints, adaptation and cultural legitimacy in comics.